For rings assemblies of 3 through 6 identical cyclic systems IUPAC recommends new numbering system. The new system composed of primary and composite locants, where primary locant indicates the position of cyclic system in assembly and composite locant is the locant inside this system. The old name 1,1′:3′,1”-terphenyl is also acceptable but not the preferred one. Preferred IUPAC names for branched ring assemblies are forming by substituting into the longest unbranched assembly. But name 3′-cyclopropyl-1,1′:2′,1”-tercyclopropane is also acceptable. The table below contains names of several assemblies generated by MestreLab/Name, and the other 3 applications. 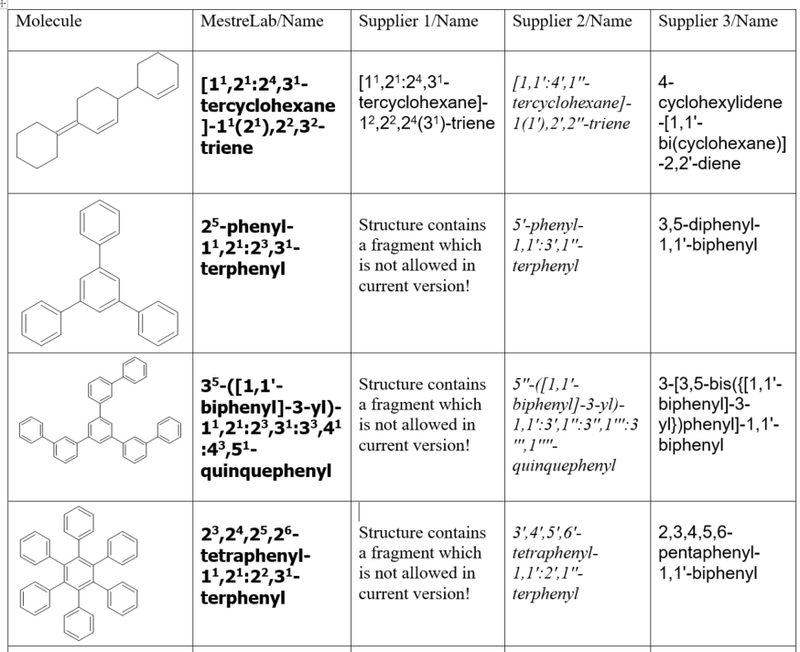 The correct IUPAC names are bolded, acceptable names highlighted with italic. Their correctness is checked according to IUPAC Blue Book 2013 (Nomenclature of Organic Chemistry. IUPAC Recommendations and Preferred Names 2013), pages 348-349,389.